The traditional arts of patchwork quilting and embroidery are being used to record the experiences of Manchester’s homeless community. 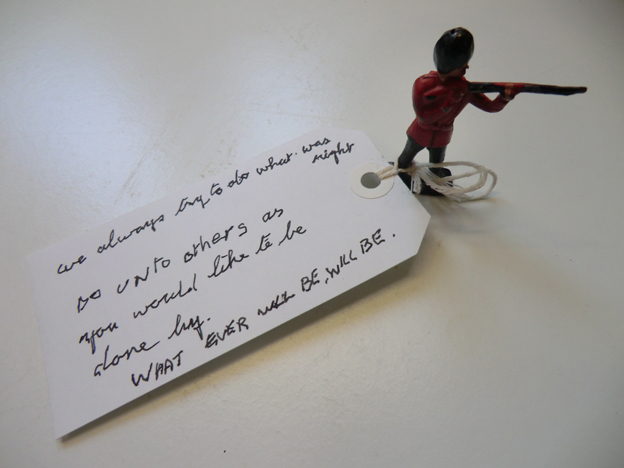 the warm /&/the cold is a project run by arthur+martha arts organisation, led by poet Phil Davenport and artist Lois Blackburn. 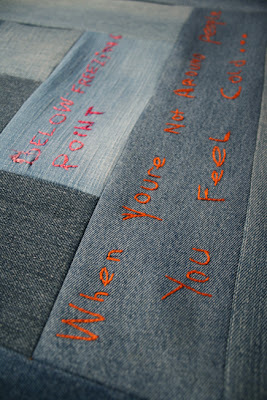 Created out of denim fabric, the quilt is made of denim from recycled pairs of jeans - twenty-seven in all - embroidered with personal descriptions of when a homeless person was warm or cold. The project began eight months ago and has taken arthur+martha right into the heart of Manchester’s homeless population working with vendors from The Big Issue in the North and also people using the Booth Centre. The project gathers together artwork, poetry and interviews born out of spending time listening to the life experiences of people living on the streets. 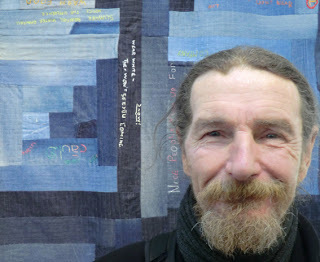 Poet Phil Davenport said: “The quilt is created by asking simple questions that have complex answers – when were you warm? When were you cold? They lead into the whole area of homeless experiences. Physical warmth and extreme cold, but also emotional warmth, or being left out in the cold of rejection. The experiences are written onto the fabric by the homeless people themselves, who have also helped embroider their own words, with support from students from Manchester Met University. Once the six by nine feet quilt is completed, it will be displayed alongside a range of other quilts made during the project at the university’s Holden Gallery, from 3 December for two weeks. These quilts will then be donated as housewarming gifts to people who are being rehoused. Little animations featuring lines from the big quilt are being screened throughout November and December on Manchester’s BBC Big Screen outside the Triangle shopping centre and on Liverpool's BBC Big Screen. Exhibition of quilts, ceramics and prints the warm /&/the cold at The Holden Gallery, Manchester Metropolitan University, starts 3 Dec 2012. As part of our ongoing project with homeless people, we've conducted many mini-interviews with homeless people, which are fascinating and moving accounts of difficult lives. We've also been in contact with many carers, support workers and helpers at the drop-ins and centres we've visited. One such is a volunteer helper at 'The Red Door' drop-in, known more officially as Bury Housing Concern. Homelessness happens to anyone, any age. Mainly it follows family or relationship breakdown, that's the main one. The big problem. We try to help people with the situation they're immediately in, whatever level of urgency it is. Have they just come in wanting a shoulder to cry on? Have they just become homeless? Do they need a bit of TLC or are there deeper problems? We work our way up the ladder, starting with what they think they need. Then we go on up. A lot of people don't understand their rights and their needs. Usually I get the tears, my job is listening. They come to me with a story and I'll ask what help they need. As somebody who has been homeless myself, I always tell them my story and then we compare notes. We end up chatting and I find out what they need - and I tell them the rest, their rights and so on. It can be very emotional. I get a lot of kisses and cuddles in this job. I think you need to be a good listener; they don't need advice ramming down their throats. Someone might've come in here for months, then one day they'll say: 'We need to talk and they'll break down in tears - and we'll talk properly. I love doing this work, the job satisfaction is so big. 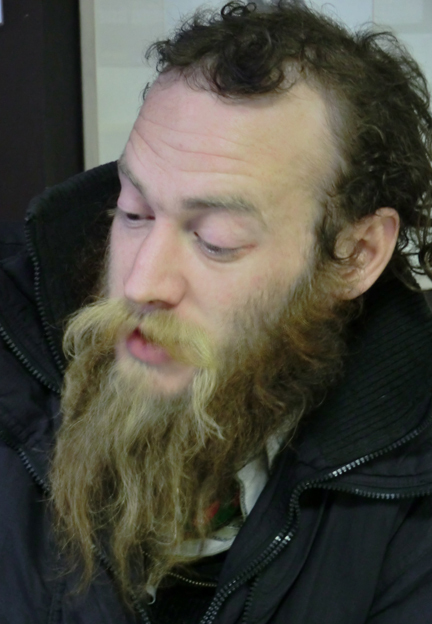 Here's an interview with Peter, a very cheery homeless man in Manchester who we met at The Big Issue in the North office today. This is one of many such encounters, documented as part of our project with homeless people in Manchester, discussing their lives. Peter comes from County Mayo in Ireland, but has his sights set on getting to as many places in the world as he can that begin with the letter M. Manchester is just the start. We've heard many accounts of just how punishing life on the streets can be, but Peter has a different point of view. I like sleeping out, I find it natural. I've an awful addiction to television. No problem with that on the streets. I'm qualified to be a farmer, I'm just one who doesn't have a farm. If you want to be a farmer you have to get yourself a farm. It's a good life outside, it is THE life. You have happiness with the time you've spent. I wouldn't be happy with a history of well-watched Coronation Street. It's very cheap on the streets, no rent, no heating bills – no heating. I find a log fire or a turf fire to be the best way of heating. It's a free life. I've been moving around the last two years. Money can be a problem, but I've always worked, always been able to make the money in one industry or another. I want to stay on the road awhile then at the end I'll buy a house and a farm. When I settle, find true love or whatever is out there. I ran out of money, the cheques started bouncing. Got a heavy prison sentence which ran me out of money more. Sold the farm - got me debt-clear but I didn't have any way of moneymaking. I started travelling, doing work. Cards for cash in Dublin, had fun with that. Kept farming, WOOF-ing (Worldwide Organisation of Organic Farming) doing odd jobs and now I've found The Big Issue. From here, truck driving or farming, see whichever comes in. See the world while I've the chance: Amsterdam, Spain, Holland, Europe, Russia, Australia – the whole lot. When you own a house you're un-free, it's restricting. It buys you a safe place to stop but you can't run out the door and be a player. You're either a jet or a homeowner. I've never come across that rough a time on the street, I'm a fairly happy-go-lucky fella. I know what a hammering is – know what a fight is and how to dodge it. Usually it's at night these things happen. I go to sleep through all that, it's the right time to be doing it anyway, at night. Find somewhere to sleep, stay in hostels, shelters, or parks, wherever you can pitch a tent. I have a tent, never leave home without one. We're working on developing reminiscence boxes, for use in care venues for older people. 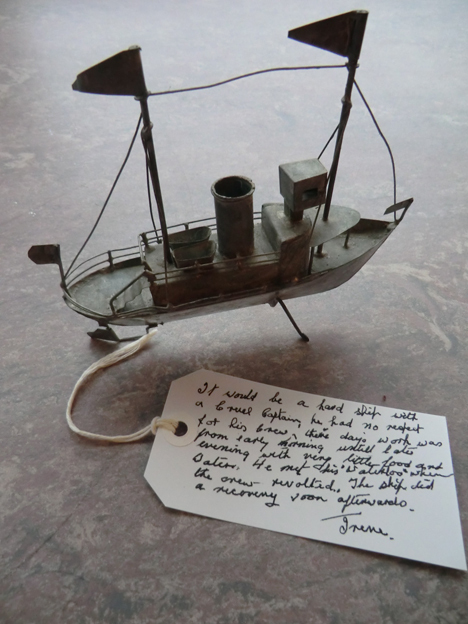 The objects in these boxes can spur very powerful remembering in people, even those who have memory problems. We're trying various techniques, many of them light and playful, to add different facets to the reminiscence experience. Today, we put the objects into a bag - participants had to identify them by touch, reaching into the bag, exploring them by touch rather than by sight. The results caused great hilarity and gave the session a different focus than usual, stimulating much speculation and concentration. Smell is famously a trigger for memory, but touch is less used. The reminiscences were cut up into lines and also put in a bag. People 'lucky-dipped' the lines, which were used to make a poem - a composition technique famously invented by the surrealists in the early 20th century, going under the title Exquisite Corpse. 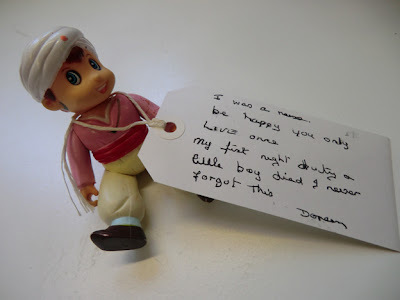 Dipping for objects and for poem lines brings an element of play into remembering and takes away from the fears that can accompany dementia. I wonder what the 10 year old me would have thought of this game? 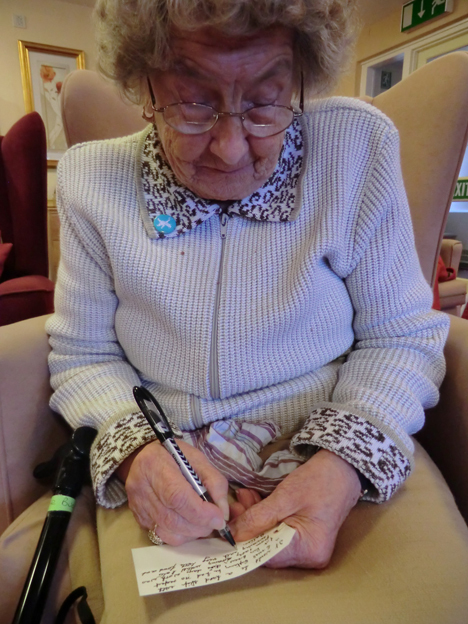 Lois and I visited Bury Dementia Cafe for the first time this week. We've been commissioned by Bury Art Gallery to devise life stories, working with people who have a dementia diagnosis and the Cafe was the latest port of call. A life story document helps people remember their lives as memory fails - an invaluable ally as they progress through the stages of dementia. It can also be crucial for carers to 'know' someone in their care quickly and to understand their mindset. Finally, life stories are a kind of heirloom which can be handed down through a family. We're experimenting with the many life story templates that are available, bringing some fresh thinking to the field. For years now we've used avant garde writing techniques to help people access and write about their memories and in this project we're trying some of those approaches. But we've also been asking participants what they believe are the most important parts of their lives and reinforcing that by recording their conversations, noting things they like to discuss. Just about everybody chipped in with some thoughts. Here are some of them below, from my notebook jottings. Life experiences and emotional histories shape our reactions. How do you react to difficult circumstances? 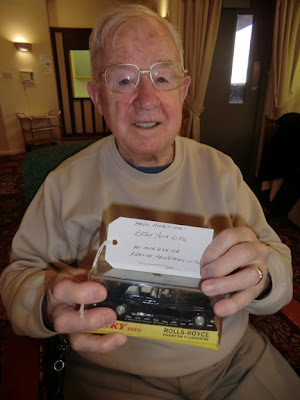 “Mum and dad's music was motown. I still love motown...” Who influenced you? How were you influenced? People you meet change you and alter your path – What's your path? What shape? Was it a wandering road or a straight line? Did you get to where you were headed? Family stays with us – how do we keep it alive? Grieve for it? 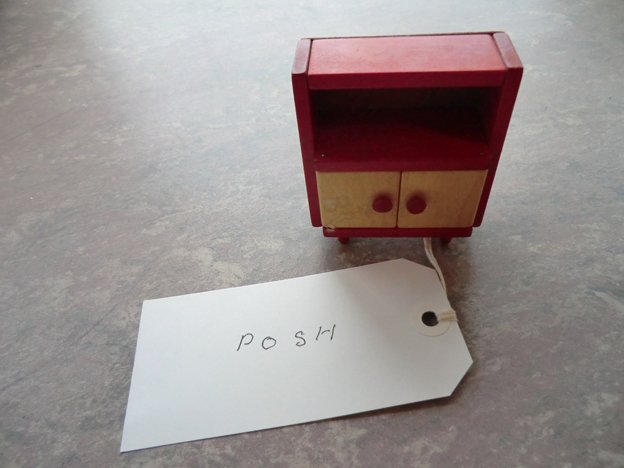 Objects have some of their power because of their personal or social resonance with history. What childhood memory would you keep? What experience would you pass on? Things you might have done (but didn't). What are the great might-have-beens in your life?